Proud Jesus blessed people at the Manchester Pride Parade. Photo by Ruthie Sarah Johns (used with permission). Jesus wore a rainbow sash to bless onlookers as he marched in the LGBT Pride Parade in Manchester, England recently. 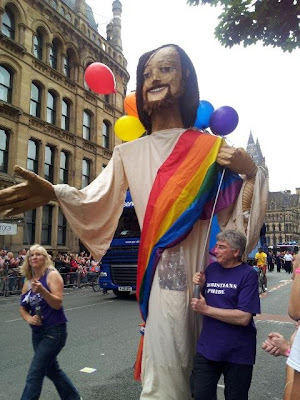 The larger-than-life queer Christ puppet was created to express God's love for LGBT people Proud Jesus also appeared this summer at Liverpool Pride, where he made a big impression on gay artist Tony O’Connell. “Where would Jesus be if he was on Earth? 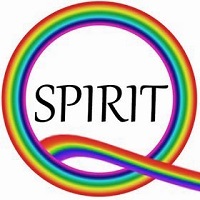 Liberty Church in Blackpool believes he would be at Gay Pride dancing, waving and laughing his way through our cities as he embraces the gay community. So that’s exactly what they created with a 4 metre high Jesus this year. “Jesus” showed up with red balloons to distract people from anti-gay protestors before joining AIDS Walk in Los Angeles Sunday. Tacky beyond belief. This does nothing for the Christian queer community except belittle Jesus. I’m sorry you feel that way, Brother Graham. I don’t usually publish short negative comments like this, but I am posting yours because you have frequently left thoughtful positive comments in the past. Many people felt blessed by the Big Jesus marching in the Pride parades. Maybe it depends on the perspective of the person witnessing it. I have the impression that you already know Christ and his love for you, but many LGBT people can’t see this until they experience something like the Big Jesus marching with them, bringing love and peace. Of course no image can do justice to the fullness of Christ. Double thanks for retweeting this - TWICE! I was already following you on Twitter. Tweet on!